Thanks to the 41 people who attended, presented and volunteered at our 2-year anniversary party. We had a great time, the presentations were concise and packed with quality. Plus we gave away some great prizes and swag (thank you autodesk!). Congratulations to A Robert Murphy Architect Inc on winning the all-inclusive ticket to Autodesk University! And a copy of 3dsMAX! We will be getting some updates on their experience which we will post right here. In his presentation, Robert showed us how two people were able to complete a large seniors residence. The building is now built and there is talk of a second. David Constable from KPMB showed us how one can use Revit from small items like furniture to large urban plans. They wowed us with their design, videos and renderings. Kathy from Stephenson Engineering presented two beautiful Revit Structure models complete with renderings. The first (pictured) which had some very large custom trusses. The second was a project which is built on granite. Using the Revit model Stephenson was able to predict the amount of blasted material to within a metre. 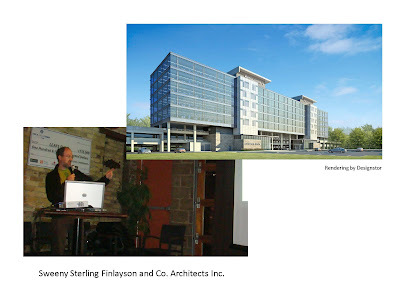 Peter Kurkjian from Sweeny Sterling Finlayson and Co. Architects showed us a local building project. &Co has been making great use of the light and shadow capabilities in Revit. Peter presented some rendering studies that described visually how the natural light would penetrate the building. Thanks also to Sheena Sharpe from Coolearth architecture who showed her latest school project done in Revit. Entire Imaging Solutions had an Exhibit table filled with their many interesting creations. They also gave away two scale models of Frank Lloyd Wright's 'Falling Water' (which was 3Dprinted from a Revit model) and $300 towards imaging services. Thank you Entire! BIM Executive Group - an informal group of Architectural Partners who’ve adopted Revit in their office, comprised of Executive/Partners from across Canada. The call took place mid September for 1 hour where Partner strategies and concerns were shared. All participants considered this a valuable session and would like to schedule more calls. Another action item from the call was to compile a list of MEP and Structural Engineers who are using Revit and to share the list across Canada. I am compiling this list now. BIM Executive Event Toronto – November 13th – Partners only, David Jefferies of Zeidler Partnership will be in the spotlight presenting BIM on The Bow. (attachment) Registration is up to 52 people at this point. Visit Seek.autodesk.com for lots of content. Public Works and Government Services Canada (PWGSC) is developing a formal BIM strategy. Thanks as usual to Alice Fazooli's downtown Toronto who always do a great job!